I love fall colors. They are so warm, and inviting. And we can't forget the little chalkboard. Hopefully people will read this so they don't wake the baby. What do you think? It's nothing fancy, but the best part about Fall is that it is fancy all on its own. I love this! 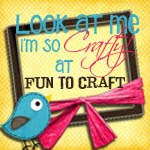 I would love to have you come link this up at my weekend link party happing tonight at midnight! I love your wreath! I'd like to invite you to share these at my Friday Favorites party! Thanks for linking up! I was tweaking with my button this morning and must have tweaked something wrong! It should hopefully be fixed now. Thanks for letting me know! Thanks for linking up at Bacon Time.